Location: Rathfarnham, South Dublin, Ireland. 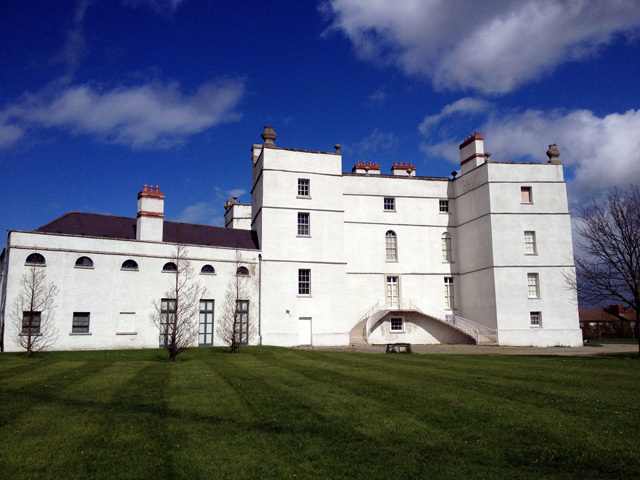 Notes: Rathfarnham Castle is a 16th-century castle in Rathfarnham, South Dublin, Ireland. The earlier Anglo-Norman castle which was replaced by the present building was built on lands which were confiscated from the Eustace family of Baltinglass because of their involvement in the Second Desmond Rebellion. It defended the Pale from the Irish clans in the nearby Wicklow Mountains. It is believed the present castle was built around 1583 for Yorkshireman, Adam Loftus, then Lord Chancellor of Ireland and Protestant Archbishop of Dublin. Originally a semi-fortified and battlemented structure, extensive alterations in the 18th century give it the appearance of a Georgian house. The castle consisted of a square building four stories high with a projecting tower at each corner, the walls of which were an average of 5 feet (1.5 m) thick. On the ground level are two vaulted apartments divided by a wall nearly 10 feet (3.0 m) thick which rises to the full height of the castle. On a level with the entrance hall are the 18th century reception rooms and above this floor the former ballroom, later converted into a chapel. Rathfarnham was described as a "waste village" when Loftus bought it. His new castle was not long built when in 1600 it had to withstand an attack by the Wicklow clans during the Nine Years' War.